Note that you must build Fluidity (or at least satisfy the libspud dependency noted in the README file) before using Fluidity-Publish. 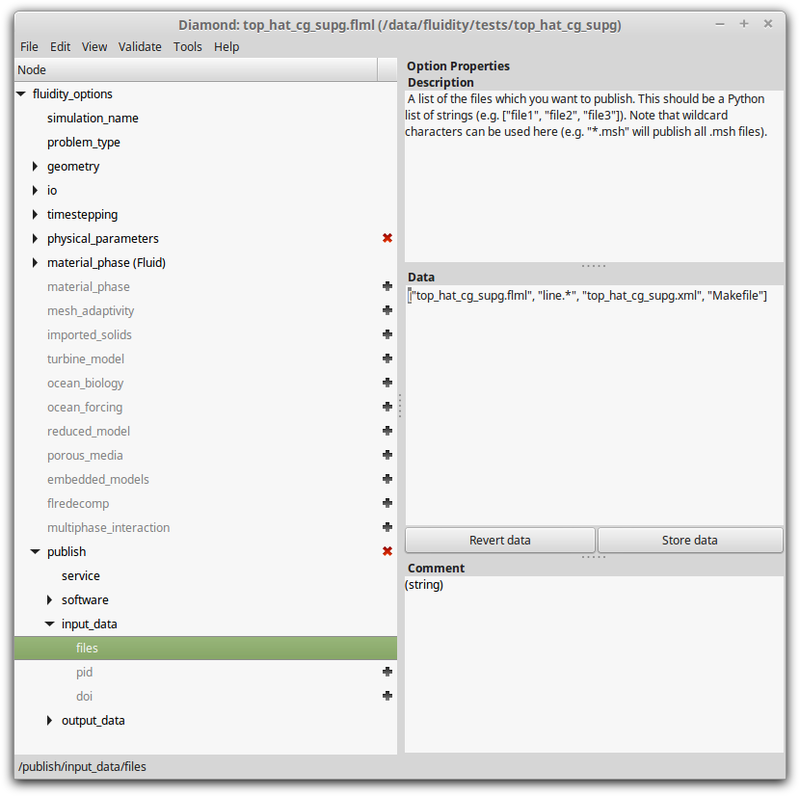 You may need to add Fluidity’s ‘python’ directory to your PYTHONPATH environment variable in order for the libspud module to be found. The publish option enabled in a simulation’s configuration file. The file is being modified in Diamond. -s : Publish the Fluidity source code. This can be used in conjunction with the -v option to explicitly choose the version of Fluidity (in the form of the Git SHA-1 hash of a particular commit) that you want to publish. -i : Publish the input data files whose paths are specified in the options file. -o : Publish the output data files whose paths are specified in the options file. -p : Publish the software or data, but keep it private. Must be used in conjunction with the -s, -i or -o option. Note that any DOI generated will not be valid until the publication is made public. -l : Set the log verbosity level (choose ‘critical’, ‘error’, ‘warning’, ‘info’, or ‘debug’). Note that the software, input data and output data must be published separately. You cannot yet use the -s, -i and -o options together. Once the publication process has finished, the ID and DOI of the publication will be added to the simulation’s configuration file for future reference. If you wish to publish the simulation data again, the ID and DOI will be re-used (unless you remove them from the configuration file). Unless you provide a particular version of Fluidity at the command-line using the -v option, Fluidity-Publish will automatically obtain the version of Fluidity from the file version.h stored in the include directory of the local Fluidity repository on your computer. This file is created at compile-time when the Fluidity binary is built. If this file is not present (perhaps because you haven’t built Fluidity yet), then Fluidity-Publish will instead use the version (SHA-1 key) of the HEAD commit of the local repository. Fluidity writes a limited amount of provenance data to the header of the simulation’s ‘stat’ file. If you choose to publish the output data (which should include the ‘stat’ file) using the -o option, then Fluidity-Publish will (if available) retrieve the IDs and DOIs of the recently published software and input data from the simulation’s options file. It will then add those to the existing provenance data before publishing the output data files that you have specified. © Copyright 2014, Christian T. Jacobs, Alexandros Avdis, Gerard J. Gorman, Matthew D. Piggott. Revision e5a0c551.